Philo Library is getting into the home delivery business, that is of library materials. This service is available to anyone who is physically unable to visit the Library. If you have a Philo Library card and have a temporary or long-term illness or injury, disability or limited mobility, or are a senior citizen without transportation, you may be eligible for our service. Getting started is easy. Call the Library (684-2896) and ask to register for Home Delivery Services. If you don’t have a Library card, and are eligible for one, we can issue a card in your name. We will then ask you to complete an application and a survey of your reading interests. Once these forms are returned, you will be contacted by a staff member who will assign a volunteer to assist you. The volunteer will select items for you, based on your interests. We will then schedule a date for your first delivery and future deliveries based on your needs. There are no late fees for our materials, but Home Delivery participants are responsible for lost or damaged items or fees from other libraries. We look forward to providing this service to you. 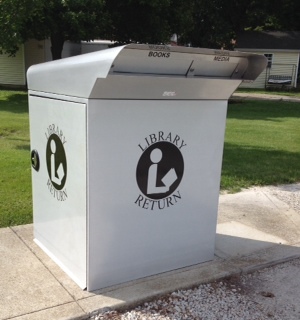 The Philo Public Library drop box was purchased though the generosity of the Bob Rice Memorial Fund and installed by Walt Crackle with help from Bill and Will Jones. The drop box has 2 drop chutes, one for books and one for dvd’s, cd’s and audiobooks. (You may now disregard the stickers on the older items asking not to be put in drop box). The location of the drop box is in the alley to the west of the library between the library and village maintenance building. The Friends of the Philo Public Library have book bags for sale for $12.00. They are the perfect size to carry your favorite books, dvds, and magazines.